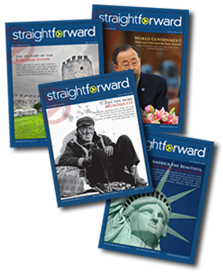 Straightforward is published online and in print by the Enduring Church of God and has no subscription or newsstand price. This magazine is provided free of charge and made possible by the tithes and offerings of the membership of the Enduring Church of God and others. Contributions, however, are welcomed and are tax deductible in some countries. Back issues available free of charge upon request. The publishers assume no responsibility for return of unsolicited artwork, photographs or manuscripts.